Dopo la due giorni veneziana dedicata all’ultimo libro di Francesco Erbani, un’altra visione positiva sulla nostra città. Sempre dall’estero o dall’esterno, da lontano insomma. 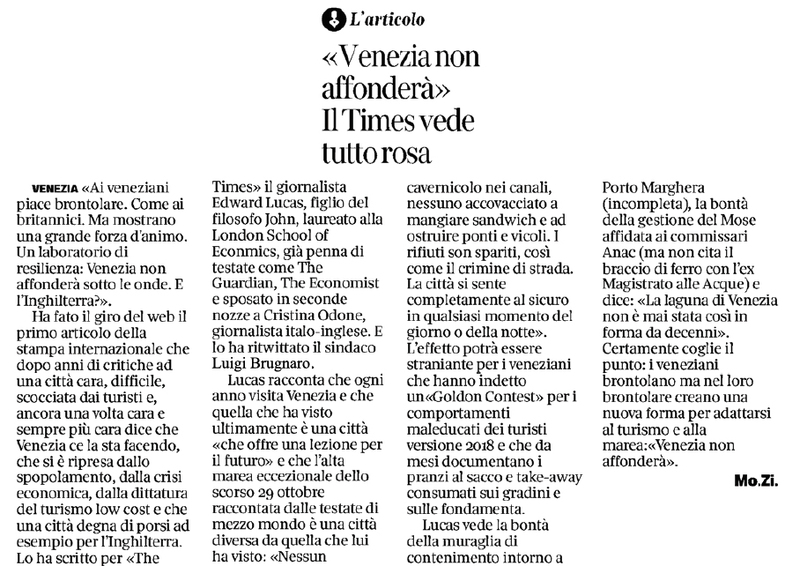 Seen from outside, it is easy to take Venice as symptomatic of wider troubles. La Serenissima’s geopolitical heyday, like ours, is long past. The citizenry regards its rulers as incompetent, bordering on despicable. The ghosts of past glories — the Rialto, St Mark’s Basilica and the Doge’s Palace — loom over an ailing city, a theme park for foreigners, host to thriving populations of pigeons and rip-off merchants. Chinese visitors hail the faded magnificence with selfie sticks and hurry on, ticking off a stop on their city-a-day tour of Italy. Last month’s events deepened the gloom. Despite the more than £5 billion spent on flood protection in the past 20 years, an exceptionally high and lengthy tide flooded three quarters of the city, corroding fragile brickwork, ruining precious parquet and dousing the internet. The headlines highlighted the threat of eventual obliteration by rising sea levels and stoked the orientalist view that the world’s most extraordinary city is too precious to leave to the bungling Italians. My annual visits suggest a different message. Far from heralding doom, Venice offers us bracing lessons for the future. Historical context is important. Past problems include repeated foreign occupation, poverty, overcrowding, and a truly devastating flood in 1966. The battle against the elements is eternal. But the most recent low point was more than a decade ago. The bureaucracy was mired in corruption; politicians and cronies drained up to a billion euros from the flood protection schemes. Tourism was swamping the city. An unspoken business model prized short-term profits over sustainability, and put quantity over quality, sacrificing precious public space to littering, urination and al fresco picnicking. Many landmarks were under seemingly permanent restoration, hidden behind garish hoardings. Much has changed for the better. Public behaviour is properly policed: no cavorting in the canals, no squatting sandwich-munchers clogging the bridges and alleys. Litter is vanquished, so is street crime. The city feels utterly safe at any time of the day or night. The much-criticised flood-prevention scheme is an unsung success story. The Venice lagoon is in its best shape for decades. The toxic waste dumps and other industrial horrors on the mainland are now safely contained behind miles of sea walls. The 40-mile-long external barrier island has been fortified. Salt marshes are recovering. The huge Mose floodgates are in place, supervised by new commissioners imposed on the construction scheme by the national anti-corruption agency. Now, only the control systems remain to be fitted. Admittedly at vast cost, the project will protect the lagoon for the rest of the century. Other coastal cities will look enviously at that. Perhaps most importantly, the demoralised public mood has lifted. If Shylock were to ask the modern merchants of Venice “what news on the Rialto?” (which has emerged, beautifully restored, from behind its hoardings), he would find a ready answer: public-spiritedness. Locals are banding together to save the nearby fish, meat and produce market. Among their allies are a vocal lobby of local chefs and restaurants, reflecting the transformation of a once notoriously barren culinary landscape. The grumpy trattorias offering a pungent, freshly microwaved “Menu Turistico” are still there, but the city now has eight Michelin-starred restaurants. A swathe of other slow-food eateries are developing less pricey but equally intriguing menus based on neglected local fare: oysters, eels and shrimps from the lagoon, edible plants and flowers, and startling flavours such as cypress resin and parsley root. Next up should be a wider offering on the musical front. Venice’s churches are a feast for the eyes but the ears soon tire of a monotonous diet of Vivaldi and opera arias. Other campaign targets include the pernicious, unsightly cruise ships. Posters dotting the squares and embankments demand affordable student housing and electric-powered water transport. 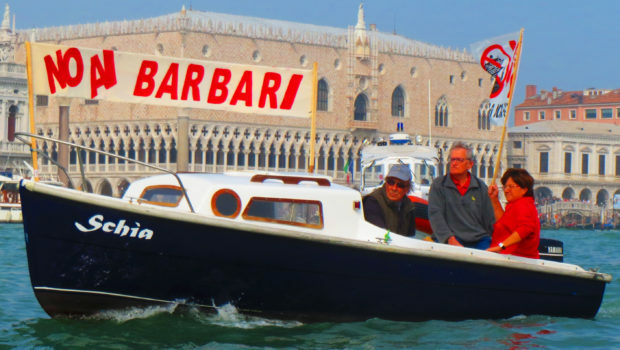 An admirable group of young people, under the banner “Venice Calls”, spend their weekends fishing junk out of the lagoon. The city is fighting, not dying. The economy lifts the mood too: it is visibly diversifying, modernising and booming. “Help Wanted” signs abound in shops. Statistics on the real population are utterly unreliable, but wandering around at night I see far fewer windows dark and shuttered. Venice still has its problems. A ticketing system for visitors to the hotspots is long overdue. Rents are rocketing: a nice-to-have symptom of prosperity. The largely unused Arsenale, the former military site at the northeastern end of the main island, is about a fifth of the city’s land area and is crying out for an imaginative and ambitious project. Too many islands in the lagoon are rotting under unloving public ownership. Venetians have a sardonic and phlegmatic approach to life. Like Britons, they enjoy grumbling. But even in the face of the most unpromising circumstances, they do not despair. Indeed, they show great fortitude in coping with what politics and nature throws at them — as witnessed in their mopping-up operations after last month’s floods. An impressive public servant tells me that she believes the city can inspire the rest of the world as it faces 21st-century problems of climate change, urbanisation and demographic stress: a “laboratory for resilience”, she calls it. Venice will not sink beneath the waves. What about Britain? 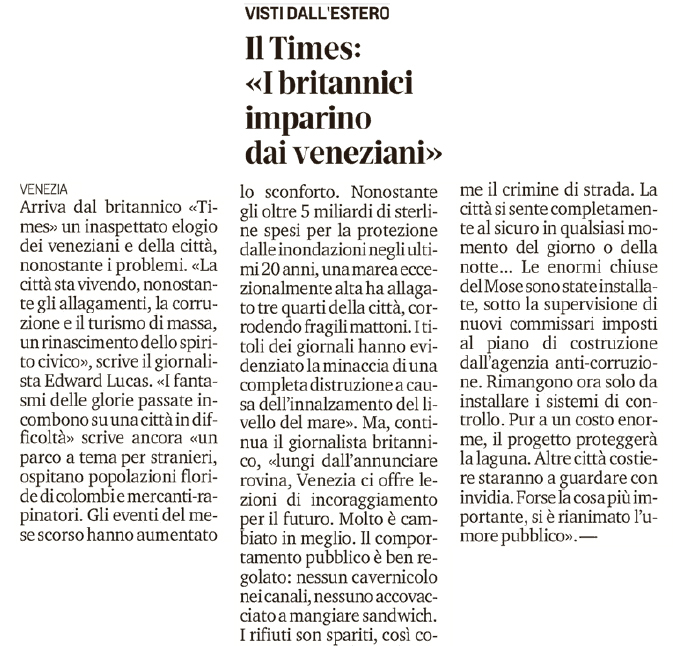 Il Times «i britannici imparino dai veneziani», La Nuova Venezia.